Today the soccer world witnessed history: the USA defeated Mexico on Mexican soil for the first time in history. The Estadio Azteca will never be the same again for American players or fans of the game. Once a mythical and almost indestructible fortress, now the belief that Team USA can beat anyone anywhere is palpable. There are some basic things to understand about this game. First, neither team was at "full strength," although Mexico fielded most of its starters except for Dos Santos and Salcido. The US, on the other hand, did not have Clint Dempsey, Michael Bradley, Jozy Altidore or anyone from its classic defense: no Bocanegra, Onyewu, Goodson, Cherundolo, Bornstein or Lichaj. Instead today we were treated to the Geoff Cameron show and an unlikely partnership with Maurice Edu. Fabian Johnson, the new left back option, shifted from left to right and allowed for Edgar Castillo to slide in at left. The defense worked. Maybe it was luck on several chances, maybe Cameron really truly is the real deal, and maybe Chicharito has lost his step. Any way you look at this, it wasn't exactly a game that the Mexicans were looking to lose at any point, not after winning the Olympics and having been unbeaten against the US in 24 tries. No, today the back four held their line well and hustled for every play. And when Cameron didn't get there Howard kept us in the game. We should also recognize that the offense had its ups and downs and didn't quite work with Torres as the playmaker and an ailing Donovan fresh from a Superclasico win by the Galaxy over Chivas USA. When Beasley and Boyd were inserted into the game, things clicked better but an enabler was still needed. Enter Brek Shea, and just as he did in last year's game versus Mexico, one play from the flank allowed for a nifty pass from Boyd to an unlikely hero: Michael Orozco Fiscal. Orozco's goal said it all for the US. This was a team win and it didn't matter who scored the goal. It didn't have to be Donovan or Shea or Gomez or even Boyd, it didn't need to be flashy and over the top. All it had to do was cross the goal line and inflate the net behind Gillermo Ochoa. This was a true American win, a win about team work, about strength and athleticism, about belief in yourself and your companions, about a dream that can be reached. Mexico will claim that Dos Santos (both of them) along with Oribe Peralta and Corona at goal will make the difference next time these rivals meet. Perhaps, yes, but consider that the USA will also have Altidore, Dempsey and Michael Bradley along for the ride. Hopefully the teams will meet again, twice, if they qualify for the Hexagonal in World Cup Qualifying with a chance to prove it all over again in a competitive match. All of us on both sides of the border can't wait. A short update. This time of the year brings a lot of outside teams in preseason matches versus MLS sides. It's also a time of unbearable heat for most of the country. This even includes Portland, where the mercury was in the 100s for their game on August 4th. Unlike places with higher moisture like in the east coast, every single seat was taken at the game. Redemption. Not because the US Women's national soccer team did anything wrong at last summer's Women's World Cup, but because they were the better team but were cruelly defeated by penalties. Redemption because today's win wrapped up a perfect tournament in which they defeated every team and outscored them 16-6, where at the World Cup they lost twice. Redemption because they were booted by Brazil in 2007 only to redeem themselves with the Gold Medal in 2008. Redemption because the American style of soccer was upheld and showed why this country sets the trend in the women's game as countries like Brazil do for men. And today we had the usual suspects clinch the tournament: Alex Morgan with her nifty pass for the first goal and opening lanes for Rapinoe and Lloyd, Wambach for her presence, Solo for her reflexes, Rapinoe for her tireless work on the flanks, Buehler, LePeilbet, O'Hara and Rampone for holding a tough line and pressing forward when needed, Shannon Boxx for her spirit, Tobin Heath for her speed, and Carli Lloyd for being a number 10. Yes, Carli Lloyd made the difference today by scoring the two goals that won the game 2-1. 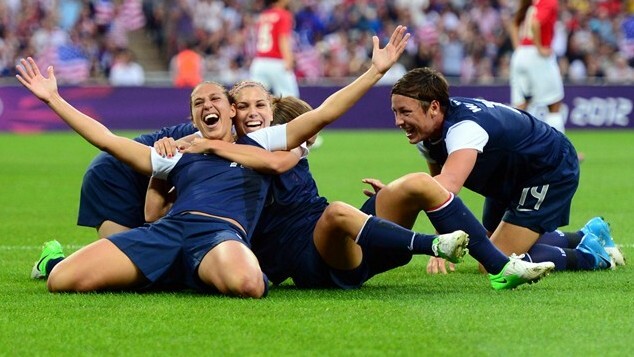 It wasn't the youthful energy of Alex Morgan, the commanding experience of Abby Wambach or the darting runs of Rapinoe. It was the number 10, the Pele, Zidane, Landon Donovan of this group. She made the difference in the final like all great midfielders do. Zidane scored twice against Brazil in 1998, Pele delivered 1958 to Brazil, and Donovan saved the US Men in 2010 twice. Always in the background working and always there at the time of need. Carli Lloyd may not be as flashy as Morgan or Wambach, but she knew how to win this game and redeem her team. Somehow the US Women's national team always find a way to make things dramatic, amazing and magical. If last year's last gasp Abby Wambach goal versus Brazil was breathtaking, today's overtime game-clincher by Alex Morgan was pure fantasy. The high-scoring Olympic semifinal versus Canada was a far cry from the match we saw in Portland last year. Canada took the initiative and Christine Sinclair scored a hat trick to bring her team within reach of the Gold Medal final. But Megan Rapinoe, Abby Wambach and Alex Morgan answered back every time Canada went ahead on the scoreboard and sealed it with the fourth goal in the 123rd minute. If Megan Rapinoe is the new engine in the midfield for the Women's team, then Alex Morgan is its new weapon. Her savvy treatment of the ball, scavenging positioning and uncanny nose for goal settles her as a perfect number 9 player and a great complement to Wambach. Let's face it, this will soon be Morgan's team as Wambach, 32, eases her foot from the soccer pedal. Alex Morgan's clinching goal is a testament to a different kind of player: less power than Wambach or Mia Hamm but a lot more finesse. Her header cradled the ball and gave it enough speed and traveling arc to ease over the Canadian goalkeeper. She put it exactly in the one place it needed to be. That is how you win tournaments.